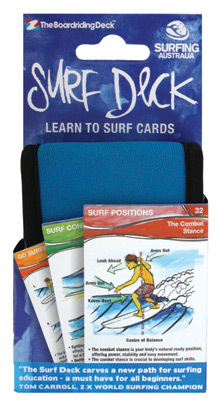 The Surf Deck is a unique and user friendly product that teaches you how to surf using a series of cards. Each card contains easy-to-understand instructions, linked with a hand painted art illustration. Surf Deck will guide you through surfing topics such as equipment, surf conditions, safety, going surfing etc, in a format that will fast track your learning process and have you up and riding in no time. Surf Deck is designed to read your topic and card number for maximum learning. Each topic is colour coded for user convenience. Who is Surf Deck for? Surf Deck is specifically designed for BEGINNERS in a format that is easy and fun for ALL AGES. Tough Neoprene Case & PVC Badge. Water Proof and Tear Proof Cards. 5 Learn to Surf Topics. "The Surf Deck carves a new path for surfing education - a must have for all beginners."